A big sigh of relief has just gone up in Port Orchard tonight. 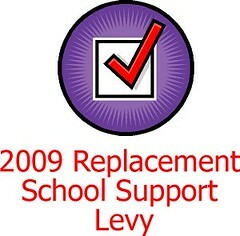 Local voters passed a four year replacement levy for South Kitsap School District. The district will still be making big cuts in spending next year due to state financial crisis; but a loss of the replacement levy would have been devastating. The building mood at work this week for both Esther and I will be pretty upbeat as many staff were anxious about the outcome.